MRM is taking a trip to the Big Easy in honor of Fat Tuesday! Join us as we explore some great mysteries set in steamy New Orleans. 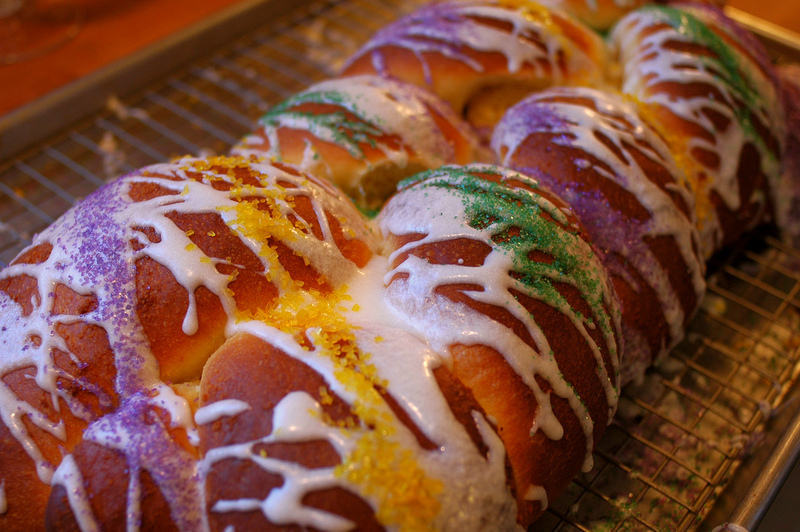 Pull up a chair, grab a slice of King Cake, and enjoy the ride. I can't think about New Orleans without thinking about Julie Smith's Skip Langdon mysteries. Her Edgar Award-winning New Orleans Mourning isn't available for Kindle, but it is a perfect read for capturing the glitz and glamour of Mardi Gras, while reminding us of the sinister potential lurking underneath the masks. If you're looking for a Kindle read, try the darker New Orleans Noir, a short story collection edited by Smith. Part of the indie publisher Akashic Books geographic "noir" series, this collection explores the seedy underbelly of the city, both pre- and post-Katrina. If you're looking for something a little closer to the cozy arena and a great Kindle value, try Barbara Colley's Maid for Murder. The first book in her Charlotte LaRue "maid for a day" mysteries, it is set in the high class, historic Garden District of the city. Eric Wilder's $.99 short story Wild Magnolias lets you drop into the Mardi Gras party if you only have time for a quick visit. Wilder takes you on a wild ride with PI Wyatt Thomas, the star of his French Quarter mystery series that debuted with Big Easy. Of course, no discussion of New Orleans mysteries is complete without mentioning James Lee Burke and his intensely moving Dave Robicheaux series. Pick one, any one, and enjoy the vivid experience of Lousiana through Burke's eyes. So, that is our peek into Mardi Gras Must Reads. I know we've missed many great ones, so leave us a comment and let us know what you think should be on the Must Read list for Fat Tuesday! The entire Skip Langdon series is worth reading, The descriptions of the French Quarter an the Garden District are really evocative. Smith captures the flavor of the city. Skip is a woman who was born into the wealth of the city but physically and temperamentally she is an anomaly. At six feet tall, she is not the picture of the magnolia blossom that the southern belle strives to portray. She is a homicide deteective; she ia definitely steel but uncomfortable with it as well. Julie Smith's New Orleans is pre-Katrina. The French Quarter and the Garden District escaped the destruction but the "real" city, not the tourist attractions, will never be the same. I know some families who moved from the city after the storm and who are unlikely to return. Readers should enjoy Skip Langdon's city and offer up a prayer for the souls who were lost and for the death of an area that was unique to America. For those looking for something even further into the past, there are Robert Skinner's hard boiled mysteries set in depression era New Orleans. Wal-Mart is the one of the greatest organization in America and working admirably. I am cheerful that this organization creates the new employments and it is useful for the youth but this https://www.essay-to-go.net/ is really helpful for me. The economy of the nation likewise will increment and joblessness will diminish.